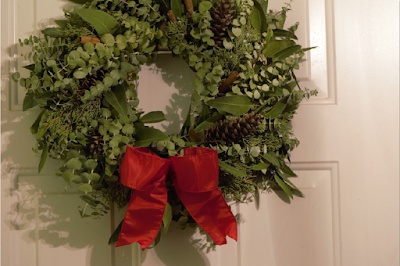 Lil' Blog and More: Creekside Farms Cinnamon Pine Cone Wreath Review! We love decorating for the holidays. It's so much fun, and let's be honest - The decor can really just, automatically add a little cheer, when you walk into a room. One of the first things grandma always pulled out, an old wreath, that was plain, boring, and outdated. For several years now, I have really wanted to get a real wreath, but never made the step. But this year, I was able to get one, by working with Creekside Farms. I was so excited, because I've always wanted one, and so has grandma. For review, we picked the Cinnamon Pine Cone Wreath. We picked this one, because we thought with the added cinnamon, it would smell even more amazing - And it did! It had that extra touch of cinnamon. We liked that, even in the boxed packaging, you could already smell the wreath, before you opened it. As soon as I told grandma that the wreath was on the way.. The same day, she put the wreath hanger up - So as soon as it arrived, we put it right up. Isn't it beautiful? You can tell that love is put into it. That's one of the things I love about Creekside Farms. It started with a small family - and it's still in that family. Creekside farms also offers more then just holiday wreaths. Usually, when you think of a wreath, you automatically go to Christmas time - But they have wreaths with herbs, flowers, and more! They have something for every season! Overall, I am very impressed with my wreath. It's stunning, and well made, and I hope we can get another next year! If you would like to get a wreath of your own, be sure to take advantage of this coupon, just for all of the readers, here, at Lil' Blog! Simply enter "RATSANDMORE-15" at checkout, and you will get 15% off of your order! I'd love the wreath you picked out as well. I love the smell of Cinnamon and made a ton of cinnamon heart ornaments this year. I'll have to check out Creekside Farms. That wreath is gorgeous. 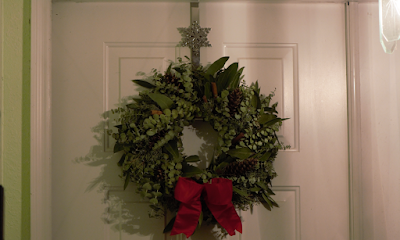 I love hanging wreaths up on my door at Christmas - there is nothing more festive. I love the smell of cinnamon. It's my favorite smell during the holidays. What a beautiful wreath and great smell, too. There's nothing like a good wreath during the holiday season. I love that this smells of cinnamon! Cinnamon is one of my fave scents of this season! Cinnamon is one scent that doesn't give me allergies, and I just love the smell. I would love this wreath! That's a beautiful wreath and looks the perfect size too. The Cinnamon smell is a huge plus! I like wreaths but usually get artificial ones. You've inspired me to consider getting a real one this year. These are really, really pretty, and I bet they smell amazing. I love the smells of the holidays! Real Christmas tress and wreaths like this are so awesome! The wreath is absolutely gorgeous. The Creekside Farms wreaths are so plush and beautiful. I checked out their website and the prices are great especially with your coupon code. Thanks! This wreath is so beautiful, it looks alive and fresh. I will like the wreath that has herbs and flowers, I am sure the scent adds to the spirit of Christmas. As soon as you said cinnamon, I was interested. I also like that's a family-run business. It's beautiful. How long do real wreaths last? I think the cinnamon makes a nice Christmas touch. This one actually can be kept for up to a year! With the right care, they last for a really long time. This is a really beautiful wreath- I love how full it is. The prices are really reasonable too! We only had a real Christmas tree once and I loved the smell that filled the entire house. Just makes the entire house feel like Christmas! Oh my, I can almost smell it! I bet that really brought the Christmas spirit into your home! Oh I love cinnamon around christmas time! What a fabulous wreath! i tell you i lovee a beautiful wreaths. my mom always decorated our wreaths and i loved it. We put our wreath out today. I love this wreath & also love the smell of cinnamon. I would most likely pick this one out myself! What a gorgeous wreath! Although it's too late to order one for this year I'll definitely keep Creekside Farms in mind for next year. This looks like a very nice wreath. I would like to get one just like it for the holidays. This is a beautiful wreath. I usually make my own wreaths but now seeing this I may have to change at least one. Simple but lovely! Merry Christmas! What a beautiful wreath! I would love a freshly made wreath, I will have to get one next year. Well it is really looking lovely, always loved these thing but never made any plans to get one, now I want one. I absolutely love cinnamon and it's actually really pretty too. What a pretty wreath, I ended up making my own for this past Christmas holiday season. I am now starting one for Valentines Day. OH its so pretty!! They sell cinnamon pinecones at the hobby store around the holidays and I just adore the inviting smell!! I bet this really got everyone in the holiday spirit!! This sounds like a unique wreath as I've never heard of one with a scent besides pine. I LOVE the scent of cinnamon...good to remember fo next year. The cinnamon would add a welcome touch (ok, smell) to my holiday decor. I bet it smelled like baked cookies! I bet the cinnamon made your house smell amazing! Really nice idea! Great review--I'm always looking for different wreaths and these sound really cool. Thanks! i like the look and the cinnamon would smell very nice. This is a beautiful wreath. I love cinnanmon. This would go good with my tree with pine cones in it. Thank you for sharing. That sounds like a really lovely wreath, I'd like to get one to have for next Christmas. Thanks for posting this review! Wow! Thanks for the awesome review.I am happy to learn about these wreaths.I think this scent is beautiful and would be so lovely to have one.I must check them out! I love the wreath! Cinnamon smell would make my Christmas! Thanks for the review! Really beautiful wreath. I was lucky to win one from Christmas Tree Shops this year. It's very nice, I too would love to get a real wreath but I would be scared I would kill it before the season was over, but they are nicer to have, and the scent is nice to have too!! this is awesome.. i would love this seeing as how i am threw with the pine smell lol.. I am buying one of these next year for sure they are beautiful. I keep saying that I'll put up a wreath but never get around to it. I think that adding the cinnamon to the wreath is a wonderful idea. It just enhances the smells. I love the holidays and the smells. I have got to up my game with decorating starting with Valentine's day. Your wreath choice is very pretty. I decorate my door with wreaths for different holidays. Love the idea of being able to smell it. The cinnamon smell is a great idea to really embrace the holiday and warmth. I always make my own wreaths and usually a few extra for presents as well. Once you've made your own, you'll never go back to shop-bought! That is cute, but seriously I could make it myself in an afternoon. I saw a recent pattern of instructions for a Fourth of July wreath so wreaths are on my mind. I love the smell of pine and cedar so I should have them around all the time. Take off the red bow and you can decorate it for any holiday or event, like the Fourth! This is a very pretty wreath. I love the smell of cinnamon.